A word that has lingered in my mind for the past couple days. It began with a blog written by a sweet friend who shared the ability to finally release her past and her insecurity- a choice she made to let go and in essence, be herself. The word lingered in a conversation I had with my fiancé- a conversation stained with fears but released to soon gain trust. And then a night at small group spent reminiscing and sharing testimonies and stories. Each individual sacrificing vulnerability for a small piece of his or her heart. A chance to truly be known. I used to hold my past with white knuckles. Afraid that letting go would release a monster that I could not contain. Who knew what losses I risked in that release- possibly reputation, friendships, trust, a chance to ever become somebody, a chance to find love. Even a chance to heal. But what I did not realize that by clinging to the past, I was defining my future. Unwilling to release, I was choosing to dwell and to become the person I wanted so badly to hide. 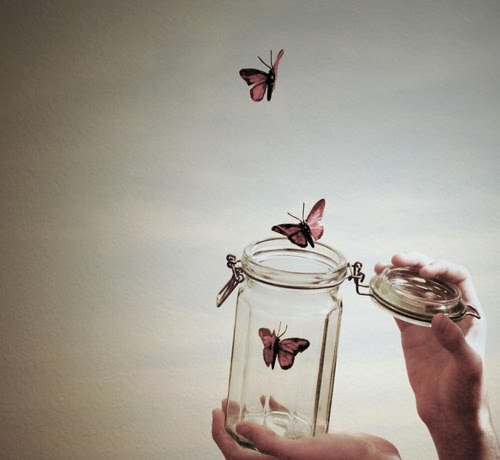 Release is a gift. The freedom with which we can open our hands to let go of that which is most dirty, most secretive, most painful, and most defining is an action bathed in the blood of Christ. His sacrifice gave us the opportunity to sacrifice what was once most sacred to us in exchange for healing, joy and peace. It gave us the freedom to find freedom. Our stories are laced with this truth. Last night as I took in each story, I was amazed at the struggles that once defined the individuals of my small group because each agonizing tear, shameful mistake or bitter frustration was absent from my perceptions of them. Yet, I also found myself wondering how often those very factors became a burden they often returned to carry. I am a prime offender of this. I love to replace my beautiful, clean garments with the dirty, soiled laundry from years past. Then parading around in shame, I struggle to own my worth. Wondering why the struggle is so great, I hardly recognize that I have made the exchange of a new beginning for an old ending. I often still try to own my past. But we are owners of one thing alone. And that is freedom. God owned our shame so we wouldn’t have to. To pick those burdens back up is to tell God that He didn’t do a good enough job, or that His sacrifice was not good enough for our faults. We attempt to deliver the problem on our own, but deliverance is given, not discovered, and prayed for, not willed. So it is in those moments of ownership that we have a choice to make. With remembrance comes the choice to redress or to release. Choose release. And own what God’s mercy has made rightfully yours, freedom.